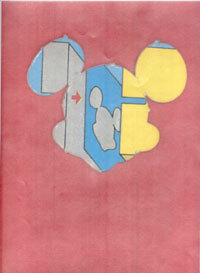 The inspiration for the work 'Mickey Mouse' is a thumbnail-sized piece of cardboard which is a leftover from a assemblage-kit from a mickey mouse book. Böhm found it, added a bright red background and emphasizes the pop art feel of this ready-made. The work is a DinA4-sized colourcopy. The rumour that there are other copies in different colours could not be verified.